When disaster seems imminent, there’s one vital decision that preppers have to make: grab your bag and bug out or hunker down and bug in? The lyrics from the chorus of a song by The Clash sums it up – you’ve got trouble either way, but one way will be worse than the other. Because this song is now stuck in my head, I thought it should be stuck in your head, too. Bugging In: This is when you shut the gate, lock the doors, and hunker down to weather the disaster at home with your supplies. Bugging Out: This is when you grab your bug-out bag and you hit the road to go somewhere else because your home is not safe. In all but the most desperate circumstances, my personal plan is bugging in. Being out on the road in the midst of a disaster means you’re a refugee. 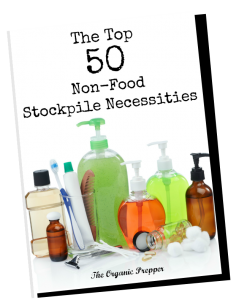 It means your supplies are minimal and that the things you’ve carefully stored over the years are very possibly going to be lost to you. The personal sustainability you’ve been cultivating at your home is also lost, including your garden, your livestock, and your water plan. If you are completely married to one, and only one, course of action, it limits your ability to perform the first step: accepting that whatever horrible event is out there, has actually occurred. You have to be adaptable if you want to be able to survive extraordinary circumstances. Disasters rarely go by a script, and your plan can’t either. The answer to this question is hard to come by. There are so many different variables, there can never be a one-size-fits-all response. Here are the major factors you have to look at. Will you be safe if you remain at home? Bugging in is my first choice, but there are some situations in which evacuation is a necessity. Last year, during the King Fire, we were only a few miles from the evacuation line. Had the fire leapt that line, it would have been suicidal to stay home. If you live near an erupting volcano, same thing. Storms like Hurricane Katrina also indicate that evacuation is a wiser course of action. Chemical spills, fires, biological contaminants, and extreme civil unrest can all be good cause to get-the-heck-out. You have to be willing to accept that no matter how fantastic your survival set-up is at your home, there are some circumstance beyond your control that would absolutely require a bug out. Do you have a place to go? Bugging out to the woods to live off the land is not a good idea for most people. While there are some folks that would be just fine, most of us would not. Are you going to go live in the woods with your children, your elderly mother-in-law, and your diabetic spouse? Even though it’s a stretch, it might work briefly in good weather. But what about when the snow flies? What about when your food runs out? What about the fact that every third prepper has the same idea and will be out there shooting at deer, thus rendering your ability to bag one nearly impossible? If you do get one, do you know how to preserve it with only what you carried out to the woods on your back? That list could go on and on. The point is, do you have a reliable retreat that is stocked with supplies? Do you have a friend in the boondocks to whom you can go? Is that friend actually expecting you, and have you ponied up with some supplies before the event to ensure that you are welcome? If you have your own retreat set up somewhere, what will you do if someone hostile got there first? If it has really, truly hit the fan, your best bet for bugging out is a well-stocked retreat location where someone in your group resides full time. Do you have a way to get there? So, you have a retreat, an awesome little compound that is up the mountain, over the stream, and around the bend. That is a wonderful thing to have. But in a worst case scenario, how will you get to it? How long would it take you to hike there, should the roads be clogged by fellow evacuees, or in the event of an EMP event that takes out the power, including that of most vehicles? Is it possible to get there on foot with the family members who will be accompanying you? How far away is your secondary location? If it is going to take you more than a week to get there on foot, your chances of making it to your destination with a family in tow are pretty slim. Your secondary location should be less than 100 miles from your primary location if you expect to get there in a crisis. A 25-mile range is optimal because it’s far enough not to be affected by localized disasters, but not so far you couldn’t make it on foot in a couple of strenuous days. Can all of your family members make the trip? It’s important to have a plan, a backup plan, and a backup to your backup. Often, in a bug-out scenario, that plan includes a difficult hike over rough terrain. Have you thought about who you’ll be taking with you? If there are children, are they old enough to walk on their own for long distances or will you be carrying them? A 25-pound child piggy-backing on you will drain your energy very quickly, especially if you are going up and down steep trails. What about elderly family members? If you have a parent who is frail, has a heart condition, or has age-related dementia, bugging out on foot is simply not an option for you unless you can rig up a sturdy cart with knobby, off-road tires, and pull it. If you have family members that can’t make it under their own steam, you must plan for your on-foot-bug-out to take far longer than it would normally. That doesn’t make it impossible – it just means that you MUST take these things into consideration, in advance, and make modifications to your travel arrangements. When to go is every bit as important as whether to go. If you live in the heart of the city, civil unrest is going down, and the homes around you are getting burned to the ground by rioters, you may have missed your window of opportunity for easy evacuation. If there are only two roads out and everyone else has decided it’s time to go, you may be too late to get out quickly. For example, places like New York City and San Francisco are accessible by only a couple of bridges. With the huge populations there, getting out of those cities would be nearly impossible if you wait too long to leave. This all goes back to the three steps to survival: Accept, Plan, Act. If the situation has shown signs of going South in a hurry, you need to get a move on. If you are going to go, go early. You don’t want to be stuck in traffic, sitting in your car, when the hurricane hits. If the local government gives an evacuation order, that means that everyone else in your area is getting that order at the same time. The roads will quickly become impassable, as traffic becomes gridlocked and unprepared people run out of fuel. If you decide that staying home and hunkering down is the best decision, then it’s time to commit to that decision. Be prepared to defend your home. Regardless of the reason you’ve hunkered down, when disaster strikes, vandals, looters, and thugs come out to play. Even if your plan is to bug in, you must be ready to change that plan in the blink of an eye. Plan an escape route. If the odds are against you, if your house catches on fire, if flood waters rise, if the levy breaks…devise a way to get your family to safety. Your property is not worth your life. Be wise enough to accept that the situation has changed and move rapidly to Plan B. Nearly everything to do with bugging out needs to be done ahead of time. 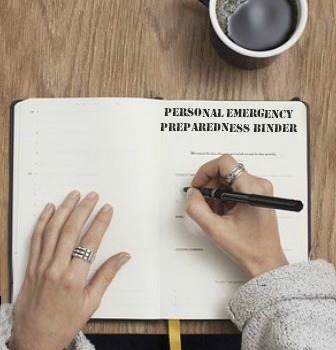 When the time comes to evacuate, you want to be able to put your plans into motion quickly and flawlessly, This reduces stress tremendously. Have bug-out bags prepared . They should contain all of your important documents in case you have to grab and go. This is the best bug-out bag article I’ve ever seen – it’s only 25 pounds and has everything you need to survive. Have a list. Make a written checklist that you can easily access. You might include the location of items that are packed away. Decide on these things now, when you have the time to calmly think about what items are the most important. When we got the first evacuation alert during the King Fire(a notice that evacuation was highly likely within the next 24 hours), a woman who lived down the street was wailing and sobbing as her husband tried to pack up their vehicle. She was rendered absolutely useless by fear. Meanwhile, my 13 year old was fulfilling her list while I fulfilled mine and we quickly made an orderly stack of important belongings, then turned on a movie to beat the stress. Had our area actually been forced to evacuate, those who panicked would have either been the last to leave, or they would have forgotten important things as they left in a disorganized rush. It’s important to decide ahead of time who packs what, and for each person to have a list. Sit down well before disaster strikes and make an evacuation plan with your family. Here’s a list of things to pack if you have time. Get organized. All the lists in the world won’t help you pack quickly if you don’t know where things are. One change we made after the fire is that all of the items we deemed precious enough to pack and take with us are stored in one area so that we won’t have to look for them when seconds count. Another friend ran into the issue of dirty clothes: he actually had to evacuate with hampers of unwashed laundry. Having your home tidy and organized (and your laundry washed and put way) will help your packing go smoothly in the event of a sudden evacuation. Have multiple evacuation routes planned. Don’t rely on GPS, either – have physical maps on hand in case you need to set out on foot. Have a destination. Please don’t think you are going to go deep into the woods and live off the land. It’s one of those movie-of-the-week ideas that will get you killed. Get fit. If you aren’t in shape, bugging out on foot through the mountains isn’t going to go so well for you. When is the last time you hiked even 5 miles? Did you have a pack on? How much did it weigh? There is a large contingent of armchair preppers who have this idea. However, they don’t exercise regularly. This is a classic recipe for a heart attack, by the way. Extreme over-exertion. High-stress situation. High-sodium, easily packable food. Out-of-shape person. A few miles into the journey, particularly if it includes a steep climb, the person will experience a pounding heart, dizziness, and faintness, as the body tries to shut down to protect itself from the unaccustomed demands. If the physical stress continues, the heart won’t be able to keep up with the demand to pump blood. This can endanger not only you, but the people making the trek with you. What if you have a heart attack half way up the mountain? What if you have an asthma attack? What if you injure your out-of-shape self? Who is going to help you? If the situation is bad enough that you’re bugging out, you aren’t likely to be airlifted to a hospital for medical care. These actions are not last minute actions. No matter what Plan A is, you need to have all of the above components in place long before any potential disaster occurs. That’s because there is no answer. Hopefully the information provided here has pointed out the important variables that will allow you to make good decisions should the need arise. The biggest part of preparedness is being able to adapt to the situation at hand. For us, bugging in is our Plan A. That doesn’t mean we have disregarded Plans B and C, which are bugging out to a friend’s place by car, followed by bugging out to the same friend’s place on foot. We also have a second location should the first one be unavailable, which I suppose would be Plan D.
Don’t just make one plan. Make at least 3. Try to figure out the shortcomings of all of your plans and solve those issues ahead of time. Whatever your plan is, strict adherence to one course of action is extremely dangerous and short-sighted. You may get through life never needing to evacuate or hunker down, but if you do, the speed at which you make your decisions could be pivotal in saving the lives of your loved ones.